- Blog - Can Your Company Survive without Outsourcing Data Entry? Internet has not only brought opportunities for small, medium and large size companies; but also that share of challenges. It has helped businesses to get connected to a lot more customers, and a lot faster if compared to recent past; but adjusting and keeping pace with ever evolving business atmosphere is stealing the limelight. Outsourcing can and has always stayed in tune with increasing requirements of businesses. It is more of a necessity and not a trend anymore. 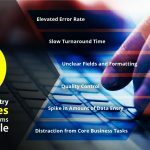 It may be online data entry, offline data entry, image entry, data typing or eCommerce data entry and various other data management tasks; increasing number of companies, businesses and organizations are realizing that it is more affordable and safe to outsource these so very important, but non-core activities. Hence, it is apparent that your company cannot survive without outsourcing data entry. What happens if your company does not choose outsourcing? Your customers and customers all over are conveniently using technology. But does that necessarily indicate that they have stopped asking questions. It’s a big NO. Everything, right from fastest internet sites and mobile apps, with top most online security – customers are yet asking anything and everything about obtaining value for their money. On top of it, they also wish to have utmost freedom of managing updates, bank account settings, and order statuses – all by themselves without the need to ask you for assistance or solutions. In case such requirements are not fulfilled, all these customers get isolated. But if your company has opted to outsource data entry, your technology and procedures will transform, as in they will be strengthened. Quality and punctuality are the virtues among various others demonstrated by innovative outsourcing partners like us (Data Entry India) assisting companies to keep their customers connected. The definition of this phrase continues to be in grey, whether it is clichéd requirements for the next significant thing or hot and happening – may be. However; according to us, it solely depends on getting and having the task done within deadlines and systematically, of course. In-house divisions are already fighting the demon of multi-tasking and most of the times are unable to contest with the rates of speed and needs of modern day business, as data entry is not their core expertise. Outsourced data entry service providers in our Cadre, are economical and proficient as well. We perform the tasks appropriately, with help of skilled data entry experts and submit the projects by due to date. We have instances where clients outsourced who started with outsourcing standalone tasks, ended up outsourcing their entire back office processes to our experts who are hell bend on performing persistently. Based on varying time zones and routines, we are equipped to enter much more data than the in-house teams of companies who have fixed work timings. Outsourcing has set free the limits and possibilities that you can use to improve your business performance. And this they can attain through sales. It is only with higher sales you can expect increased profits, but it can be attained through increased productivity only. Reducing production time is completely in control of companies, may it be through including customers themselves in a conversation, or talking to data entry service providers like us who have the expertise and experience of attracting customers through smart connections. By not taking the DIY approach, you have freed your time and conserved money to spend on other crucial aspects of your business. If we take 9 hours work time of your sales team as a benchmark, they would have possibly made a lot of difference, if your data entry projects are being handled at a lower price by an outsourced company. Most of the leading business studies have shown their inclination towards outsourcing, due to benefits like improved business efficiencies and performances. Businesses, from large to home; they do not simply economize – but also save a lot of time, hazard, and anxiety with help of outsourcing. If we sum it up all, no company can afford to stay afloat while they say no to outsourcing. Your company alike others, is looking out for options to save a lot of money, but how to save that money is completely up to you. Whether your company would want to save a lot of money by opening up the doors to sub-standard contenders or pay a nimble contender what they deserve and increase revenue through operational efficiencies. This will bring in a lot of value addition in form of quality of work and enhanced brand image. If your company has made up the mind to outsource data management tasks to a company, to experts who have been there and done all this numerous times, no need to look further than Data Entry India.